My intention was to disable secure desktop like it the RemoteAssistance of Microsoft it does, while the PCHelpware software is running. I found no way to get this without reboot (if someone knows how to do, tell me please, I will make a new "workaround" with it). But I found a way to disable the requests completely during PcHelpware is running. I have tested it successfull with Windows Vista and Windows 7 Beta. Second download http://www.megaupload.com/?d=IHLLG7Q8 and extract it (attention: The file in the archive is called "PcHelpWare.exe". Don't overwrite your server with it). Open your PcHelpWare server (7-Zip self extracting archive) in 7-Zip and rename the PcHelpWare.exe contained in the archive into PcHelpWareRun.exe. Drag and Drop the PcHelpWare.exe out of my archive into your server archive and confirm the question. I've created this using Nullsoft installer system. 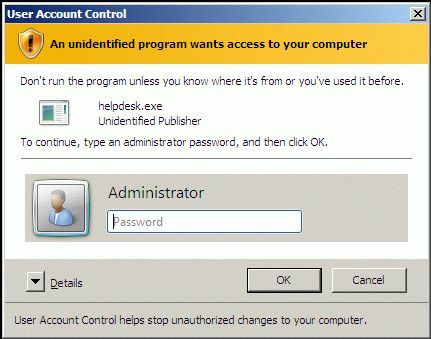 Name "UAC Request Disabler (Temporary) for PcHelpWare"
Last edited by karstenschilder on 2010-02-15 17:03, edited 2 times in total. Has anyone else gotten this to work? I tried, but haven't had much success. There are mutiple things named pchelpware.exe. Not sure which one i am supposed to rename and replace. Is it after i create my server or before. Is it in the create server folder or the create server/Server folder? transambird_2000 wrote: Has anyone else gotten this to work? I tried, but haven't had much success. There are mutiple things named pchelpware.exe. Not sure which one i am supposed to rename and replace. Is it after i create my server or before. Is it in the create server folder or the create server/Server folder? You have to create the server self extracting archive (this one singe file you get by pressing the create button in viewer). Then you have to open that file in 7zip. Then you have to rename the PcHelpware.exe to PcHelpWareRun.exe, that is inside the self extracting archive. After you renamed that file add the UAC Disabler (filename: PCHelpware.exe). Thanks, Works great Exactly what i was looking for. Many of our users who need remote support do not have administrative rights for their computers (Vista OS). Whenever they start running PHW server, they are blocked by the above window. Can this solution overcome this problem? This is very helpful for me. I have been frustrated with prompts I couldn't see, requiring someone to be available on the other side. Thank you. Too bad it won't work for a standard user, but that is understandable. If you send me the file I can also upload it on the forum server, for example. Using the supplied code on the original post, I downloaded and install the program (Nullsoft installer system) and created the attached file. When I originally created my server I renamed it to connect2kevin.exe, so this is the file I opened using 7Zip (I think you can only modify the completed file). Inside my file I renamed PchelpWare.exe to PcHelpWareRun.exe and then added (drag and dropped) the PcHelpWare.exe into the archive and saved it. Which version of Nullsoft did you use? I have tried all versions from 2.46 back to 2.43 and they seem to create the PcHelpware.exe using BCJLZMA2:16 as the compression method. The resulting self extracting archive fails with "Unsupported Method" at 97% followed by "Unspecified error". If I remove the Nullsoft PcHelpware.exe and go back to the original pchelpware.exe, the file extracts and runs OK. I have followed the instructions above and pasted the script into Notepad and saved the Script which is then called in Nullsoft. Since Megaupload has disappeared off the face of the internet, I'd like to request a re-upload of the tool. I also made a tiny stub program after reading this thread.